Cold morning out there again, 27 degrees! But it was another cool and sunny Fall day out. Started off my day with a Egg White Scrambled Egg on a toasted Healthy Life Whole Grain English Muffin. Also I had some Eckrich Turkey Sausage Links and a cup of Bigelow Decaf Green Tea. Not a bad way to kick-start my day! Did a couple of loads of laundry for Mom and cleaned up some leaves outside. After that it’s Sunday and it’s NFL Football for the rest of the afternoon! 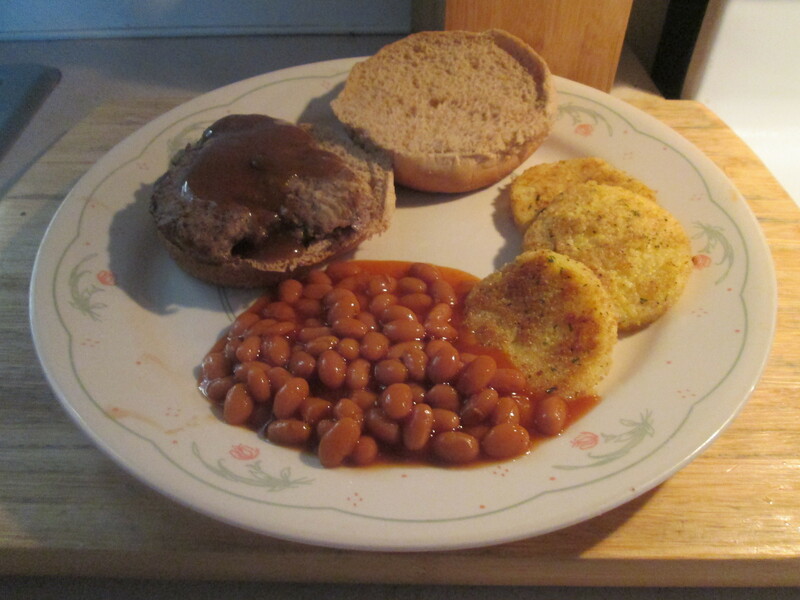 For dinner tonight I prepared a Cubed Steak Sandwich w/ Fried Polenta and Vegetarian Baked Beans. 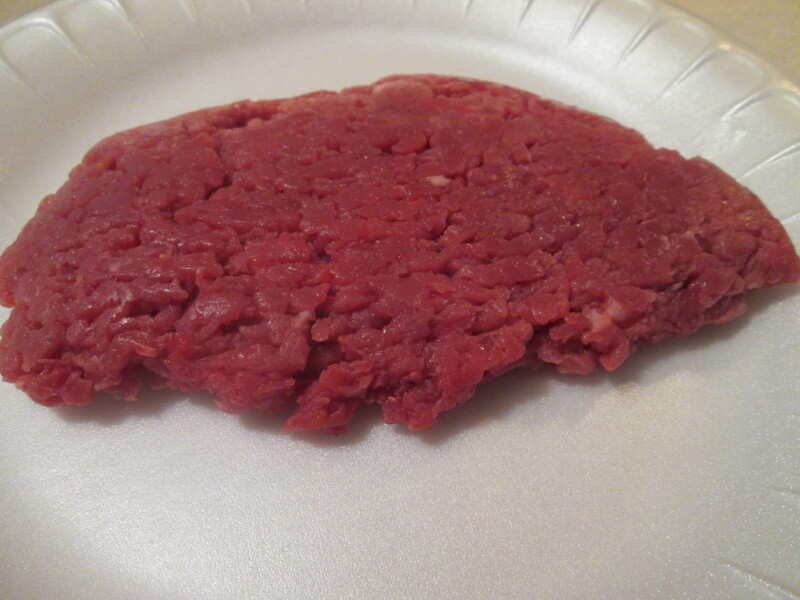 I rarely use Beef anymore but when I do it’s usually my absolute favorite Cubed Steak, Meijer Cubed Steak. When I go to Meijer I always pick up a package or two. The best Cubed Steak I have ever found by far. They’re good size patties so I was able to cut them in half and get 2 meals out 1 pattie. To prepare them I seasoned them with Sea Salt and Ground Black Pepper and I then rolled them in flour that I had mixed with a bit of Hungarian Paprika. Shook off the excess flour and pan fried them in Canola Oil, about 4 minutes per side. They came out delicious! Excellent flavor and very tender, especially for Cubed Steak which sometimes can be somewhat tough and stringy. Served it on a Kroger Lite Wheat Hamburger Bun and topped it with some Heinz Mushroom Brown Gravy. I’ll have the other half for breakfast in the morning. For one side I prepared Fried Polenta. It’s been a while since I had Polenta so when I was at Jungle Jim’s Market my last visit I picked a roll up. I use Frieda’s Organic Traditional Polenta. it comes in a roll, so all you have do is slice it and then prepare it the way you want. To make it I’ll need Egg Beater’s, Progresso Italian Style Bread Crumbs, Kraft Reduced Fat Grated Parmesan Cheese, and Extra Virgin Olive Oil. To prepare it just lightly coat the slices in the Egg Beater’s and gently shake off the excess. Then dip each slice in the bowl of bread crumbs and coat well. Then I fried the slices, heated the Extra Virgin Olive Oil about 1/4″ deep in a skillet and fry the slices for 2-3 minutes on each side. They fry up golden brown with a nice crust, flavorful, and a moist center. Then for another side I opened up a small can of Bush’s Vegetarian Baked Beans. I had tried these in a dish I prepared a while back and fell in love with the flavor and taste of the Vegetarian Beans! Only 130 calories, 0 fat, and 24 net carbs per serving. 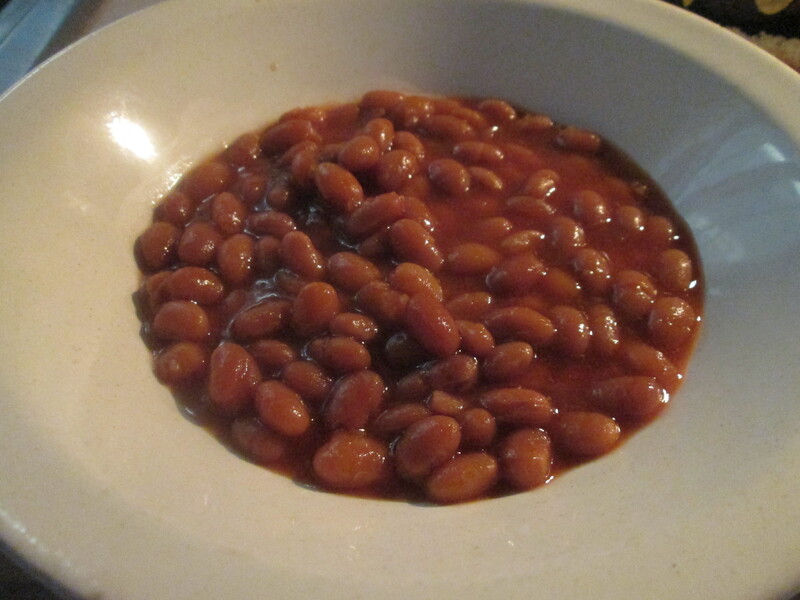 To prepare the; just open the can and empty the Beans Into Saucepan. Heat To Simmer until heated through. Love these Beans, becoming my favorite real quick. A simple but delicious dinner tonight! For dessert later a Jello Sugarless Dark Chocolate Mousse Cup. Another day of sunshine here in West Chester! A bit hotter and a bit humid in the late afternoon but not too bad. For Breakfast I had a Healthy Life Whole Grain English Muffin topped with Smucker’s Sugarless Blackberry Jam, and a cup of Bigelow Decaf Green Tea. Need a loaf of Bread and Eggs so I went to the Kroger up the road. While there I checked to see if they finally had the Bluegrass Lean Brats in yet, and they did! My email campaign to Bluegrass Meats paid off, and they are in all local Kroger in the area. Again thank you to Bluegrass Meats for following up on this and making it happen. Using the Lean instead of the normal Brats is a difference of 100 calories per Brat, huge difference! 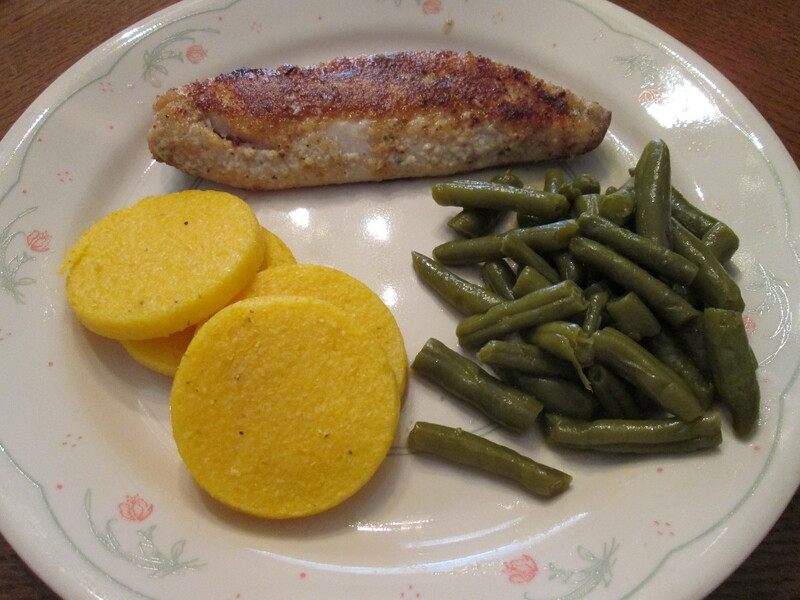 Anyway for dinner tonight I prepared a Seasoned Haddock w/ Green Beans and Fried Polenta. I did grill a Bluegrass Lean Brat for Lunch though! I had a fillet of the Haddock in the freezer that I let thaw overnight in the fridge. To prepare it I cut the fillet into smaller pieces. Then rinsed the fillet in cold water and patted dry with a paper towel. I then seasoned it with just a bit of Sea Salt and put the pieces in a Hefty Zip Plastic Bag where I then added Zatarain’s Lemon Pepper Breading Mix. Shook until all the pieces were well coated. Shook off the excess and pan fried them in Extra Virgin Olive Oil, frying them about 3 minutes per side until golden brown. Haddock and Zatarain’s Lemon Pepper Mix, the perfect combo. The Zatarain’s Breading and Seasonings are my favorites. For one side I prepared Fried Polenta. 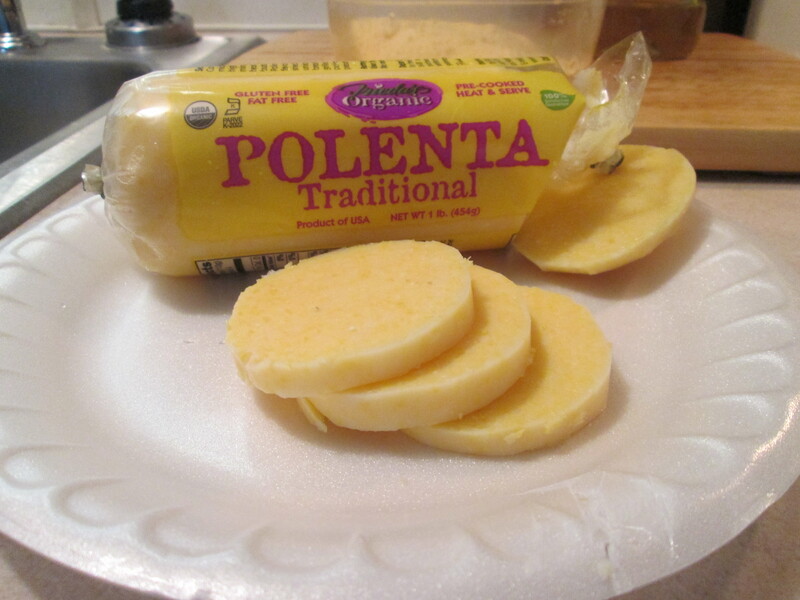 It’s been a while since I had Polenta so when I was at Jungle Jim’s Market last week I picked a roll up. I use Frieda’s Organic Traditional Polenta. it comes in a roll, so all you have do is slice it and then prepare it the way you want. To make it I’ll need Egg Beater’s, Progresso Italian Style Bread Crumbs, Kraft Reduced Fat Grated Parmesan Cheese, and Extra Virgin Olive Oil. To prepare it just lightly coat the slices in the Egg Beater’s and gently shake off the excess. Then dip each slice in the bowl of bread crumbs and coat well. Then I fried the slices, heated the Extra Virgin Olive Oil about 1/4″ deep in a skillet and fry the slices for 2-3 minutes on each side. They fry up golden brown with a nice crust, flavorful, and a moist center. Then I also had some Green Beans. My Mom had gone to Jungle Jim’s and purchased a mess of them and prepared them, love Green Beans especially when they’re fresh. For dessert later a Jello Sugar Free Double Chocolate Pudding topped with Cool Whip Free. It’s been another hot and humid day outside again. From what I hear it’s going to worse as the week goes on! Went and checked on Dad early this morning at the rehab center and then off to do some grocery shopping. Went to Kroger, they had some items on sale we needed. 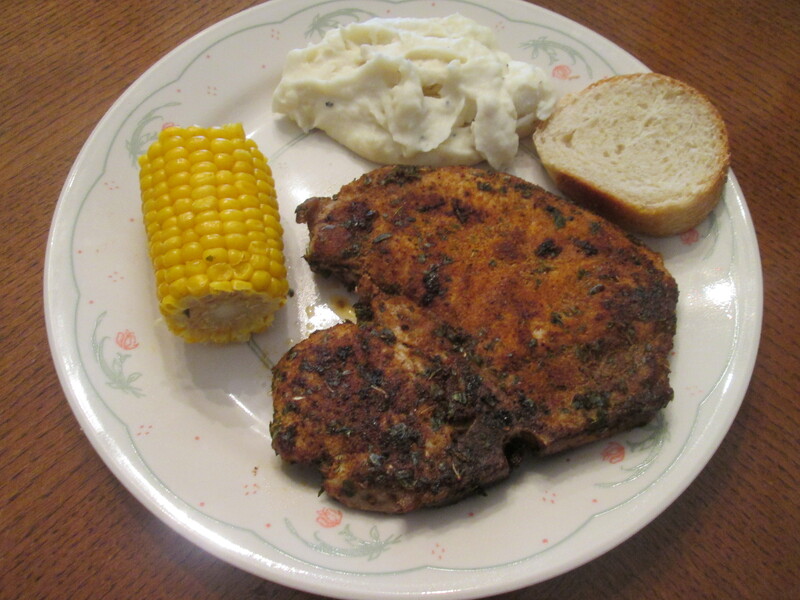 For dinner tonight I prepared a Cumin Spiced Pork Chops w/ Mashed Potatoes, Corn on the Cob, and Rustic French Bread. To prepare my Chops I’ll need; 1 tbsp Roasted Cumin, 1 tsp Garlic Powder, 1 tsp Chili Powder, 1 teaspoon Sea Salt, 1/2 teaspoon Hungarian Paprika, 2 teaspoons Dried Oregano, and 1/4 teaspoon Black Pepper. To prepare it preheat oven to 400°. Combine all the ingredients; rub it all over the pork chop. Let stand 20 minutes. Heat the oil in a Cast Iron Skillet over medium-high heat. Add pork to pan; cook 3 minutes, browning both sides. From the stove to the oven and bake at 400° for 11 minutes or until a thermometer registers 155° (slightly pink), turning after 5 minutes. Let stand 10 minutes before slicing. 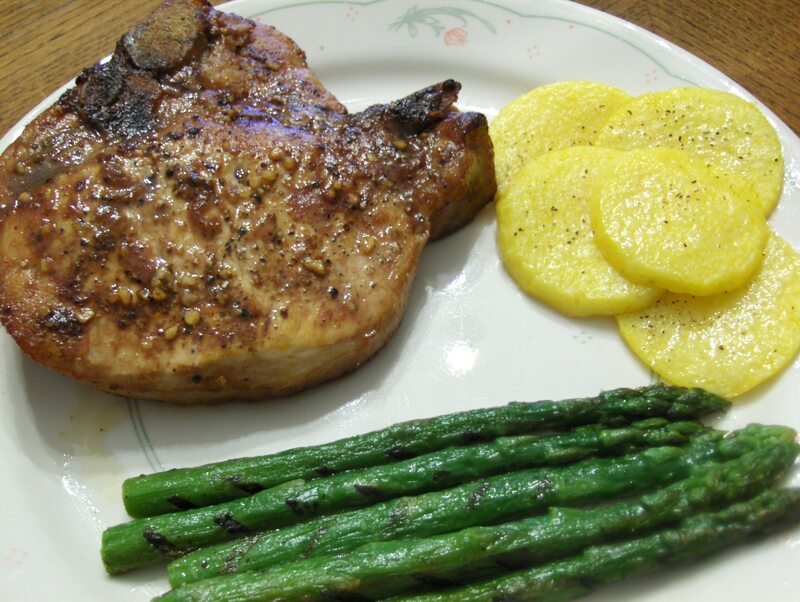 Then get ready to enjoy one delicious Pork Chop! Fantastic combo of Spices, which made one incredible Crust on the Chop with the inside being tender and moist! By far my favorite Pork recipe anymore, great on Tenderloins, Roasts, or Chops. For one side dish I prepared some Bob Evan’s Mashed Potatoes, my favorite Mashed Potatoes by far. Just microwave and serve. Then I boiled some Green Giant Mini Ears of Sweet Corn. As good and sweeter than some fresh Corn on the Cob. I also baked a loaf of Pillsbury Rustic French Bread, my Mom’s favorite so I bake her some whenever I can. Delicious dinner tonight! For dessert later a Healthy Choice Dark Fudge Swirl Frozen Greek Yogurt. Our love for vegetables began over 100 years ago in Le Sueur, Minnesota. Today, we still have fourth-generation farmers who pick each crop at the peak of perfection. 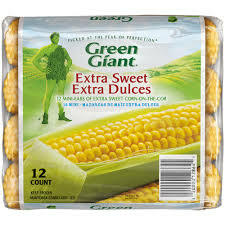 That’s how we make vegetables like Green Giant Extra Sweet Corn-on-the-Cob Mini Ears unforgettable. That’s Green Giant. Came across some nice looking Red Snapper fillets while at Kroger earlier in the week. 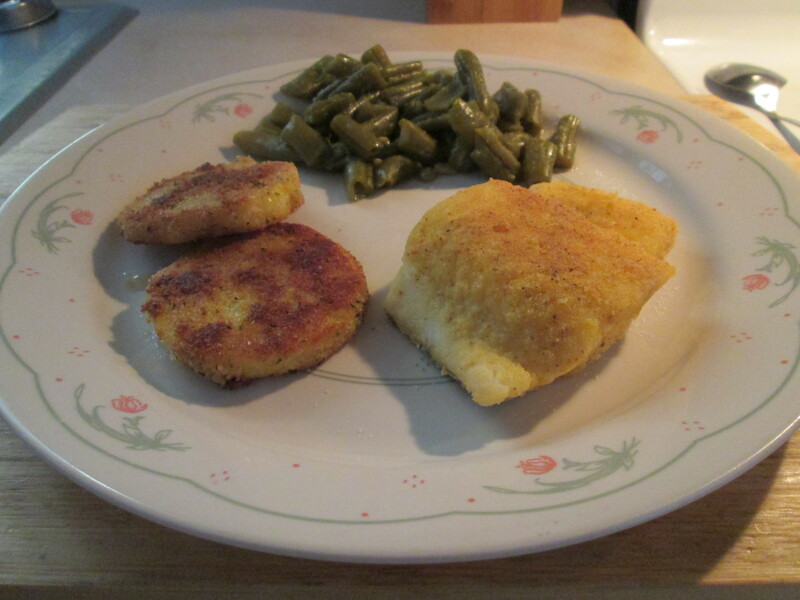 So for dinner I had Crumb-Coated Red Snapper w/ Green Beans, Polenta, and Whole Grain Bread. 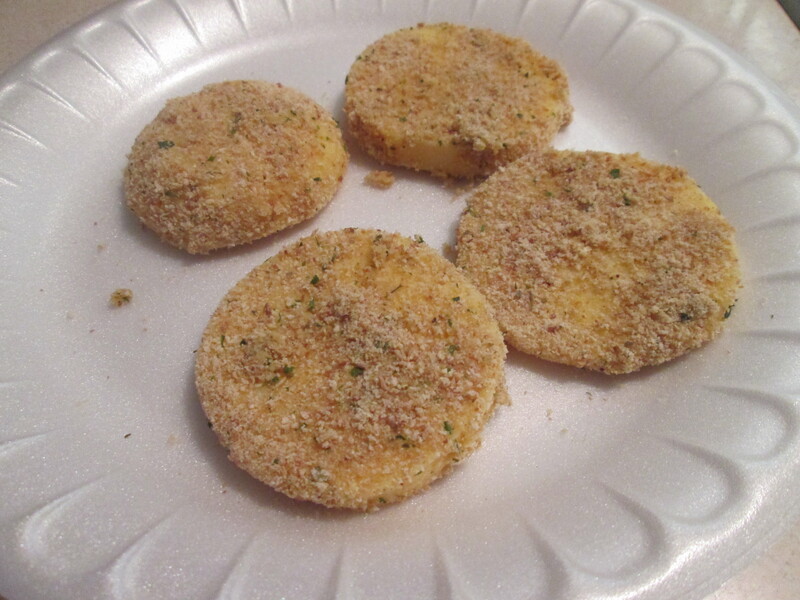 In a shallow bowl I combined Progresso Italian Style Bread Crumbs, Parm Cheese, Lemon-Pepper and Sea salt. I then rolled the fillets in the mix completely coating them. 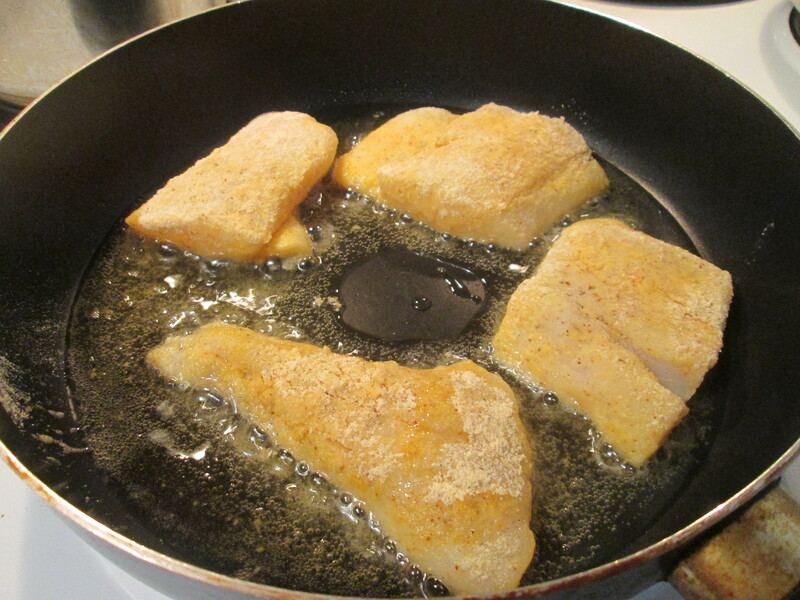 Then I fried the fillets on medium low heat in Extra Virgin Olive Oil about 3 1/2 minutes per side. Golden Brown and delicious! For sides I had Frieda’s Organic Traditional Polenta. I sliced the polenta thinly into 1/4-inch-thick slices. Placed on a lightly oiled baking sheet. Brushed the polenta with a 1/2 tablespoon of the oil. Baked them at 350 degrees for 15 minutes. I left the info and web site link for Frieda’s Below. Along with the Polenta I had Del Monte Cut Green Beans and Healthy Life Whole Grain Bread. 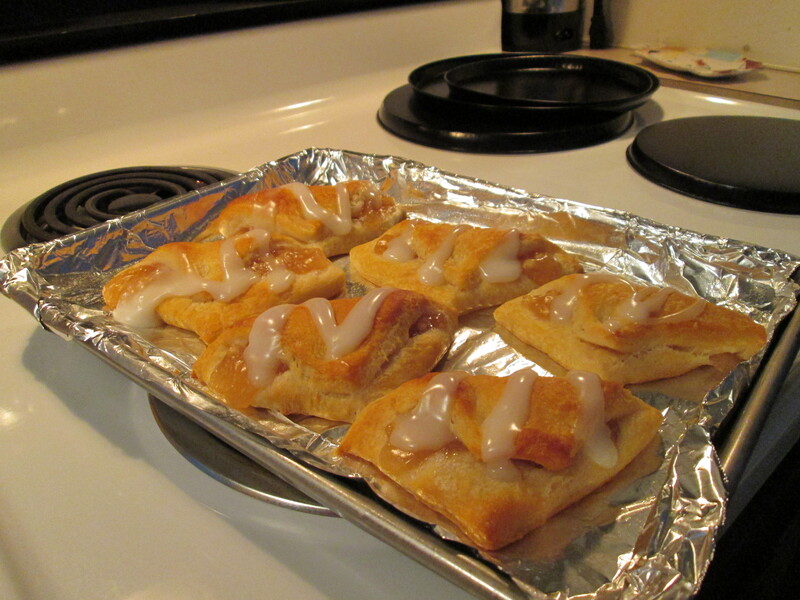 For dessert I baked some Pillsbury Apple Turnovers topped with a scoop of Breyer’s Carb Smart Vanilla Ice Cream. 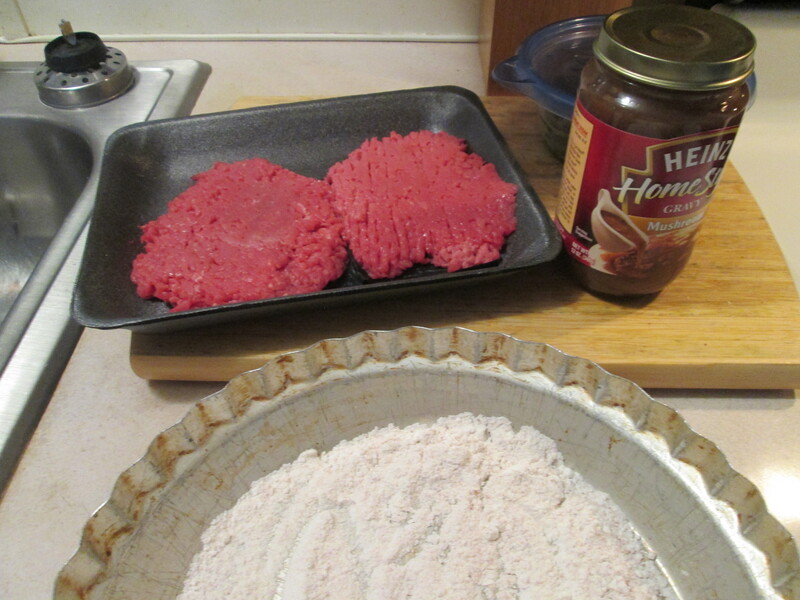 salt; add fillets, one at a time, and turn to coat. Nutrition Facts: 1 fillet equals 288 calories, 10 g fat (2 g saturated fat), 62 mg cholesterol, 498 mg sodium, 10 g carbohydrate, trace fiber, 36 g protein. Diabetic Exchanges: 5 lean meat, 1 fat, 1/2 starch. Originally a humble peasant dish, polenta is now on the best restaurant menus in America and has made its way to become a staple in many home kitchens. This versatile dish can be grilled, fried, sautéed and broiled. 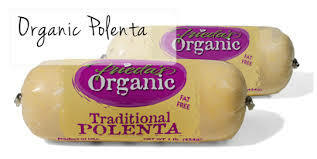 Frieda’s Organic Traditional Polenta is 100% organic and ready to enjoy straight from the tube. It’s delicious served as an appetizer or with roasted meats and poultry as a healthy side dish. Usage: Delicious broiled or sauteed as a side dish for roasted meats and poultry, or heated and served with mushroom, tomato or cream sauces for a healthy, filling first course. Lake Perch! it was Fish tonight for dinner. 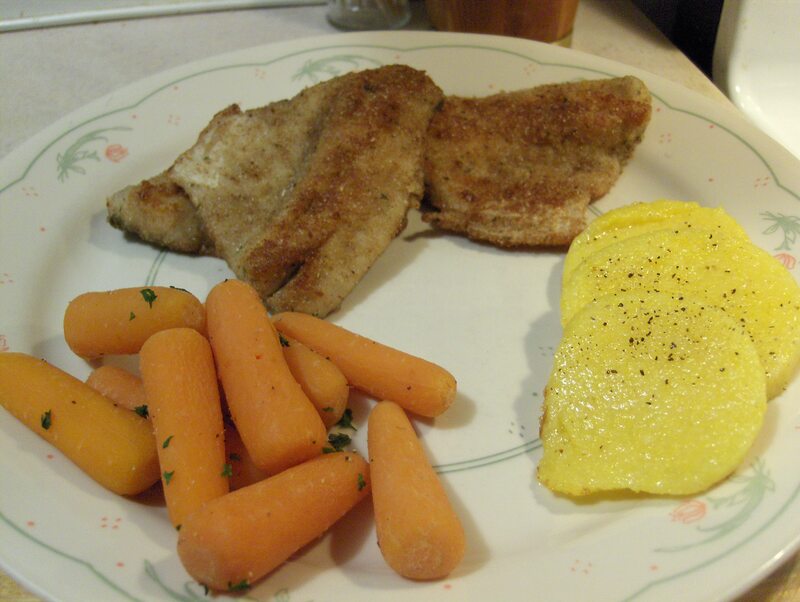 I had Lake Perch fillets that I had purchased from Meijer Seafood Department. I seasoned them with Sea Salt and Ground Black Pepper and coated them with a Italian Bread Crumb and Whole Wheat Flour mix. Fried them in extra Virgin Olive Oil about 4 minutes per side. Came out golden brown and delicious! For sides I had Frieda’s Organic Traditional Polenta. I sliced the polenta thinly into 1/4-inch-thick slices. Placed on a lightly oiled baking sheet. Brushed the polenta with a 1/2 tablespoon of the oil. Baked them at 350 degrees for 10 minutes. I left the info and web site link for Frieda’s Below. I also had boiled Mini Carrots and Healthy Life Whole Grain Bread. For dessert later a Yoplait Chocolate Eclair Parfait. Nothing beats a rainy blue day than a hearty and healthy dinner. I had a baked Pork Chop that marinated in JB’s Fat Boy Haug Waush BBQ Sauce for about 3 hours. After removing from the marinade I seasoned it with McCormick Grill Mates Applewood Rub and McCormick Grinder Sea Salt and Black Peppercorn. I baked at 350 degrees for 40 minutes turning once. As usual when using J B’s Fat Boy Sauces it came out moist and delicious! For sides I had Frieda’s Organic Traditional Polenta. I finally found more of this yesterday while shopping at Jungle Jim’s. There are many ways to fix Polenta I sliced the polenta thinly into 1/4-inch-thick slices. Placed on a lightly oiled baking sheet. Brushed the polenta with a 1/2 tablespoon of the oil. Baked them at 350 degrees for 10 minutes. I left the info and web site link for Frieda’s Below. I also had Grilled Asparagus that I lightly salted with Sea Salt and had Healthy Life Whole Grain Bread. For dessert later a Yoplait Chocolate Eclair Parfait.